Hey everyone I am new to this forum and posting on forums as well, normally I just read but now I need help specific to my project. Sp I am putting in KL7800's as my front center and right channel and using KS 525's for rear left and right. What receiver would best be suited to run these? For added information I'm doing a whole home system. And could use so,e suggestions in the multi zone field I have four separate zones that need to be able to play any source as well as volume controlled. Any helps would be greatly appreciated. I am using all Klipsch Speakers for this build and everything will be in one cabinet. Thanks!! P.s. Can I mount the KL-7800's on their side without losing performance? It dedends on how much you want to speand and how soon the HT will be ready. The Pioneer Elite SC 87 or 89 would fit the bill. Last years models may still be available for deep discount. These have the Dolby Atmos and muti-zoned. Hard to believe I brought my SC 35 brand new in 2011 and it is starting to get a little long in the tooth. I don't need anything else till the jump to atmos and 4k. I was curious, so I went and looked the the Pioneer 87 and 89 manual. Indeed you can have 4 zones. The main room you are in, zone2, zone3, and one called the HDZONE. 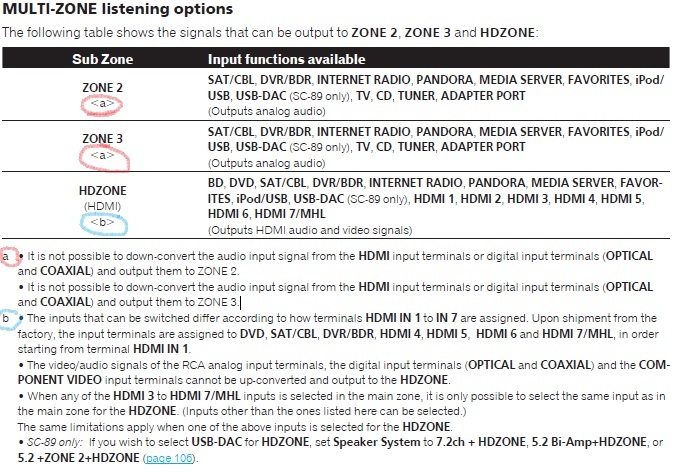 You will need separate amplifiers in the zone2 and zone3 if you plan on having a home theater surround in zone1. You will need to have a receiver with an HDMI input for the HDzone. There are some limitations on what can be going on in all the zones at once from a single AVR as well as limitations on what can be done in zones 2 and 3 period and what can be done from the HDZONE. Attached are snippits from pg 41 or the manual. So if you wish to have those zones fully capable stand alone zones, you may be better off with something else like airplay, etc. It depends on what your intentions are in the other 3 zones. 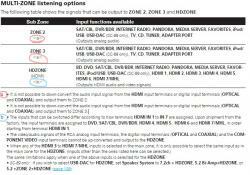 If you use a single AV Receiver you will still have to buy support equipment for each additional zone. Perhaps you could share some information on the intentions for the extra 3 zones?